Would you like to know how to take a relaxing essential oil bath? Using essential oils in bath water is an excellent way to not only relax, but to detox the body as well! But stop! Before adding essential oils to bath water read this! There is a right and a wrong way to use essential oils in bath water. Adding essential oils to bath water is an excellent way to utilize their amazing qualities! I love using essential oils in the bath for many different reasons. They are great for relaxing and easing tired muscles after a long hard day. It is a great way to encourage a deep and peaceful nights sleep. And it is a great way to support the body in times of sickness. 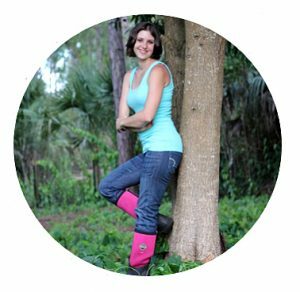 Are there any water soluble essential oils? Unfortunately, essential oils are not water soluble. This means that they will not dissolve into water. If you add essential oils directly to bath water they will simply float around in a small clump on top of the water. Then they will cling to one spot on the body instead of dispersing evenly throughout the bath water. You will not receive the best benefit by using essential oils in the bath in this way. 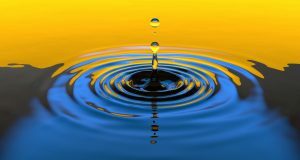 How to dissolve essential oils in water. There are two methods to dissolve essential oils in water that I recommend. The first is with bath salts. Mix the essential oils into bath salts well and then add the salt to your bath water. As the salt dissolves into the warm bath water the oils will evenly disperse with them throughout the whole tub. The awesome thing about adding essential oils to bath salts is that the salts do more than just dissolve the oils into the bath water! Bath salts help to push the essential oils into the body and then as the bath water cools they help to draw toxins from the body! You can really use any salt. 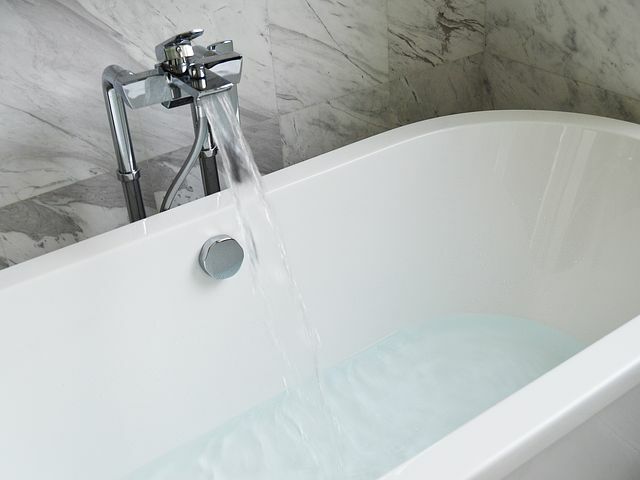 Epsom salt is a great salt to use for adding essential oils to bath water. My favorite salt to use though, is this dendritic salt. Dendritic salt has a stronger drawing power, which will help to draw more toxins from the body. Also, dendritic salt is a very fine salt which will dissolve faster in water. It’s the only salt I use for baths! The second method that I recommend for adding essential oils to bath water is with a carrier oil. You can use any carrier oil that you would like. Grapeseed oil works well, or almond oil, or avocado oil. Whichever oil you prefer! The nice thing about using a carrier oil to add your essential oils to the bath is that the carrier oil is also very moisturizing to the body. Simply mix your essential oils into your carrier oil well, and pour it under the running water in the bath. I prefer the salt method because I feel that it mixes better into the water. But try it both ways to see which is your favorite! How much carrier and essential oils should I add to bath water? 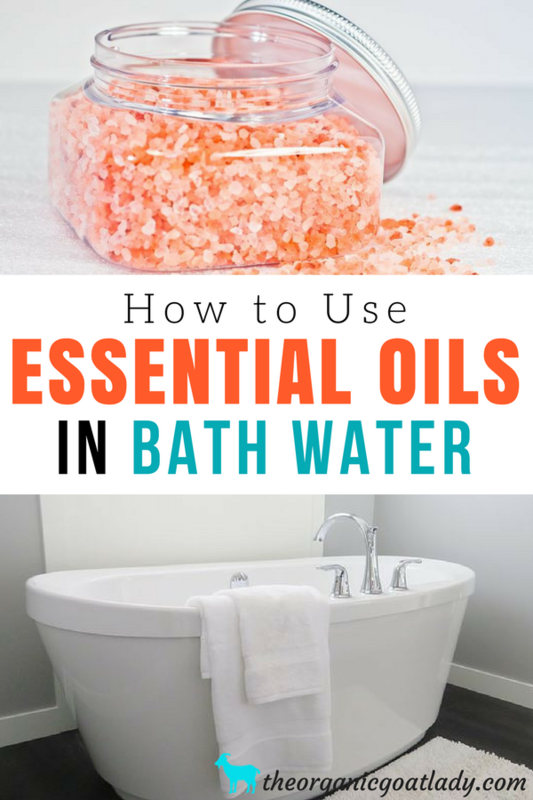 If you are adding essential oils in water using epsom salt, then I would recommend adding about five drops of essential oils to about 1 cup of bath salts. However, if you are using the dendritic salt that I mentioned above use 2-3 scoops with the scoop that’s included. If you are adding essential oils in water using a carrier oil, then I would recommend adding about five drops of essential oils to half an ounce of carrier oil. After adding your essential oils to your bath salts or carrier oil simply add that mixture to warm running water and sit back and enjoy! You will receive the most benefit from your oils by soaking for at least 20 minutes. Do you use essential oils in the bath? 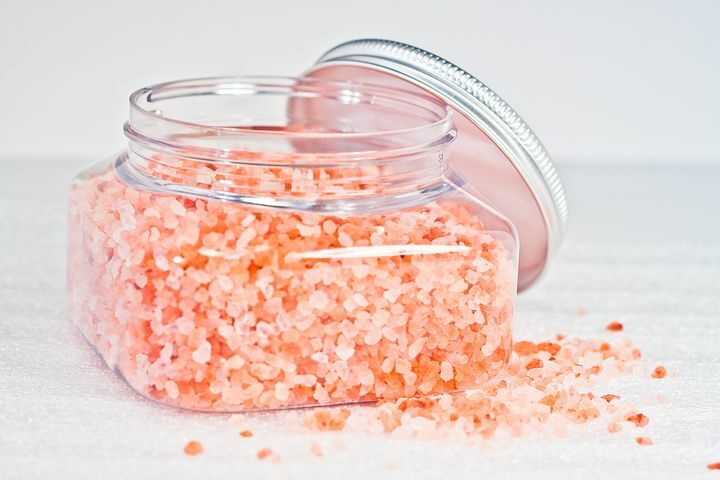 Do you add your essential oils to bath salts or a carrier oil? Which is your favorite, salts or carrier oil? thanks for your article – I love making new bath salt blends, but am careful about ingredient quantities. I have a favourite green tea & lavender that looks and feels great. I’m so glad you enjoyed the article Elisha:) And green tea and lavender sound like a great combo! I would have to assume that the salts would be better. I would think using a carrier oil would have the same result as just using the essential oil and just float in top. Please let me know if I am mistaking. I personally like the salts better and feel that they are more effective at dispersion the oils. The carrier oil will help the oil to spread out better than just the essential oils themselves just because its a larger amount, but the salts do dissolve and disperse better. Thank you for this info! Trying to figure out how to make therapeutic/antimicrobial baths for a staph infection. Do you think more essential oil is appropriate in such a case? Or should I keep it to 5 drops ? I am not a doctor, so I really can’t say. If you have a homeopathic or natural doctor that you can consult they will be able to advise you better. I personally have used more drops in the bath when dealing with problems. I have used up to 10-20 drops at times, but again, consult your doctor before doing so as everyone is different.